What a crazy week it has been around the studio. 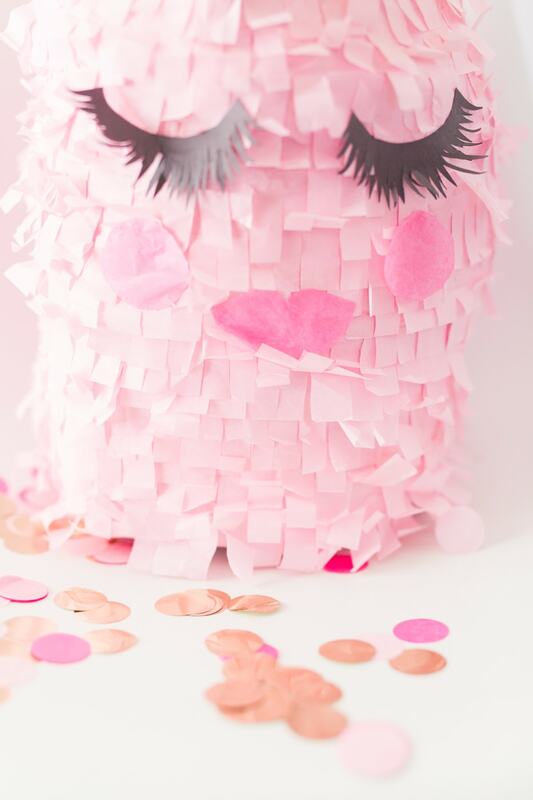 When I am not painting pineapples pink, I am basically having a whole fringe hay day creating pink pineapple piñatas. I feel like eyelashes make everything so much more fun! Right?? 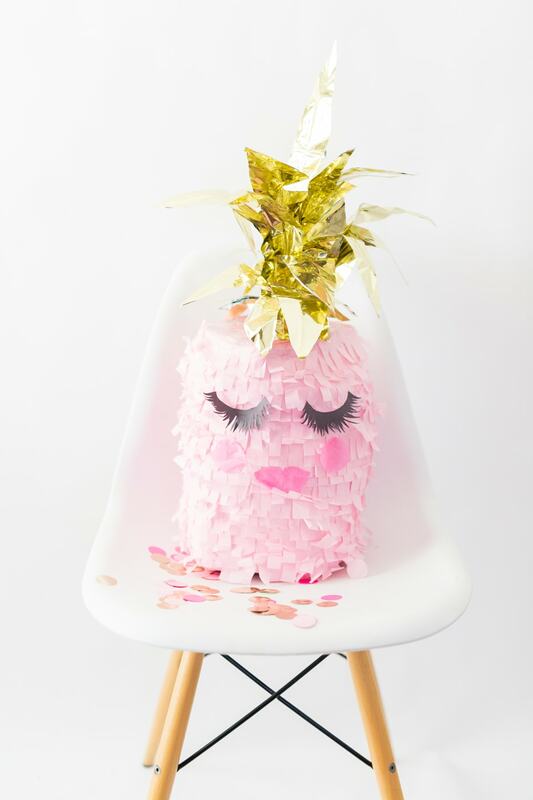 If you’re looking for some party inspiration, this glamorous pineapple piñata is sure to fit the bill! Fold presentation board into a rounded shape and tape. Cut lines a few inches up from the top and the bottom to form a base. Fold the cut edges in to make the pineapple shape. Hot glue a bottom and a top to the pineapple shape using pieces of cardboard and string for holder. 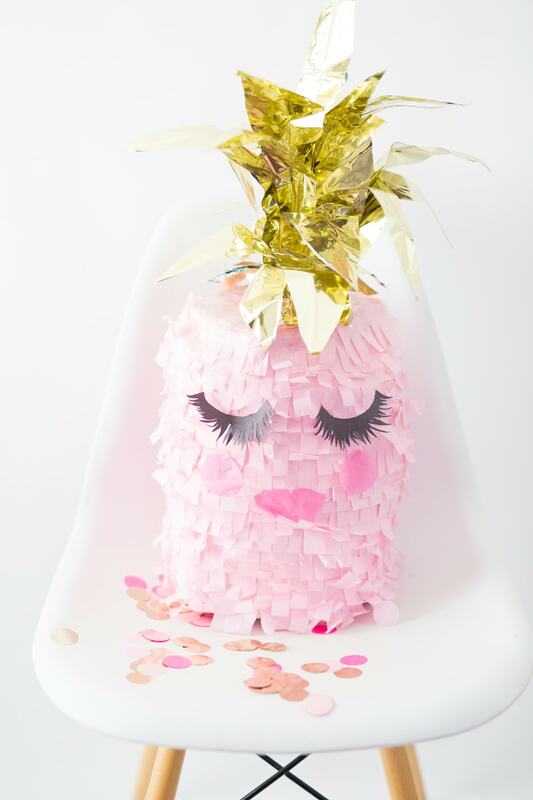 Paper mache around the presentation board to keep everything together and to mold your fun pineapple shape. Using a box cutter, cut a hole in the back for a place to load your candy. Cut 2-3 inch long strips of light pink tissue paper and fringe edges. Glue fringe down starting from the bottom and working your way up to create a layered look. Draw out lashes on black construction paper with a white colored pencil or crayon to lay out lash design. Cut out lashes and glue them onto your pineapple. Cut lips and blush out of hot pink tissue paper and glue on. To make the leaves, cut 2 same-sized leaf shapes and glue floral wire into the middle. This allows the leaves to bend or stand straight up – whichever you would like. 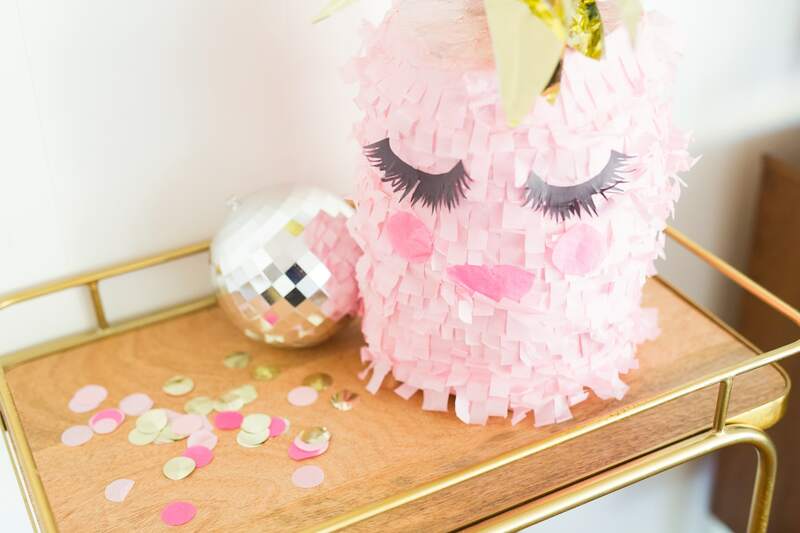 Tape leaves together once you have a large bundle and make a hole on the top of the pinata to place wires in. Now fruit ninja that pineapple and get your treats!